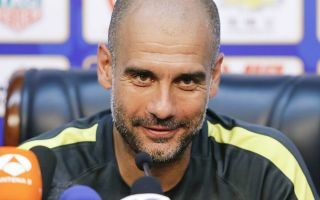 Man City are approaching a decisive part of the season and Pep Guardiola is reportedly set to receive some very positive news on the injury front. The Spanish tactician has already led his side to the League Cup this campaign, but they will now continue to target the Premier League title, Champions League and FA Cup after the international break. In order to compete on multiple fronts and give themselves the best chance of beating top-level opposition, Guardiola will know that he needs as close to a fully fit squad as possible to fend off Liverpool in the title race, starting against Fulham at Craven Cottage on Saturday afternoon. As per freelance injury analyst Ben Dinnery’s tweet below, it’s suggested that the Man City boss could receive a triple injury boost with Kevin de Bruyne, John Stones and Fernandinho all being tipped to recover in time to face the Cottagers. Those are three fundamental figures in City’s side and through the backbone of the line-up, and so it will undoubtedly be music to the ears of their coach as he will undoubtedly benefit from having them back in the squad, let alone in the starting XI. It remains to be seen if they all do get the green light from the City medical staff to feature, but based on the tweet below, it certainly sounds promising from a City perspective. In contrast, it will be a blow for Liverpool to see their title rivals get that much stronger with players returning from injury, with the Merseyside giants facing Tottenham on Sunday knowing that they’ll have to respond with a positive performance and result of their own.